We know plants recycle carbon dioxide, returning oxygen into the air, but some plants are actually much more beneficial to the workplace. NASA has identified several common interior plants that can remove compounds such as benzene and hexane in the range of 50% to 75% of the total volatile organic compounds. To put it more simply, plants help remove air pollutants caused by chemicals such as formaldehyde used to process furniture, paint and carpeting. Offices with plants may show 50% to 60% fewer airborne molds and bacteria than rooms without plants. Pothos (Devil’s Ivy): All parts of this plant are toxic if eaten, so keep it away from pets! It’s a great choice for even the non-plant person. Set it on the filing cabinet because it will grow and grow, and its trailing heart-shaped leaves are beautifully marbled in white, yellow or a paler green. Pothos is one of the easiest plants to keep alive because it can tolerate low light, low humidity, and somewhat erratic watering. But trim it back if you don’t want a 6-foot trail of ivy! And yes, it is a great air purifier. Pothos like to have their soil dry out completely between waterings; if it starts to droop, water it. Heartleaf (Sweetheart) Philodendron: This plant also thrives under fluorescent lights and forgives neglectful owners; it’s almost impossible to kill. It has dark green, shiny, heart-shaped leaves and makes a wonderful conference table plant or hanging plant. Water it well and then wait until the top half of soil is dry before watering again (if the leaves yellow, it’s overly watered; if they turn brown, it’s thirsty.) While it can live in low-light conditions, it will flower best in medium or high-light rooms. Philodendrons remove air-born toxins such as formaldehyde, which is found in floor coverings, cleaning agents, pressed wood, etc. (NASA lists a Heartleaf Philodendron as a clean air plant). But keep it away from pets, because it’s toxic if ingested. Peace Lily: This elegant flowering plant is another NASA certified clean air plant, and it is, in fact, one of nature’s best indoor air purifiers. It’s also hardy – it tolerates low light as well as dry air – but it will bloom well if you maintain consistently moist soil and put it under bright fluorescent lights. Place it close to a window, but not in the sill. For best results, mist the leaves occasionally (it’s natively a tropical plant) and water it once a week just until the soil is damp (no standing water); a slight droop is okay, but try to be consistent. Though beautiful, peace lilies are poisonous; the leaves are very toxic for both humans and animals. Rubber Tree Plant: This plant, which can grow 2-10 feet indoors, is ranked among the 10 most effective plants for counteracting off-gassed chemicals and contributing to balanced internal humidity. Rubber trees require a little more sensitivity to their needs, though they are still considered easy to grow. The plants like light, but the best is filtered, such as near a window with sheer curtains. If it’s too dark, the leaves will lose their gloss. Keep it steadily moist, but don’t let water stand in a saucer used beneath it. If it gets too much water, the beautiful full green leaves will turn yellow and brown and fall off. Toxicity levels depend on the variety; presume it’s poisonous to pets. Lucky Bamboo: Looking for an emotional boost? This tropical water lily (it really isn’t bamboo at all) has caught the fancy of Feng Shui followers who credit the plant with bringing peace, strength and luck to its environment. It’s office friendly and grows well in indirect sunlight. You can choose to grow it in soil or water; if you choose water, use a tall glass with stones and change the water once every two weeks. A healthy plant has bright green leaves; if the leaves turn yellow or brown after you own it, it’s probably getting too much sun. Sometimes its stalks are braided and twisted into all kinds of shapes, though it can be scarred by bonsai wiring techniques. 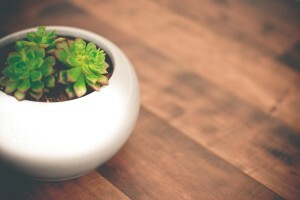 Regardless of your aptitude for raising plants, these plants are great options for a greener, healthier workspace.